Need some exotic weapons to arm the agents in y0ur latest world-conquering organization? Or something to use on that pest of a superhero? How about some mysterious alien artifacts to equip those BEMs recently arrived from Alpha Centauri? Look no further! 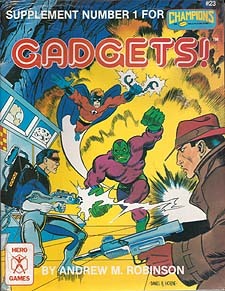 Turn to Gadgets choose from scores of powerful and strange weapons and gadgets and find whatever you need to fit the situation! Includes personal weapons, protective gear, movement aids, squad-level weapons and gear, and security equipment.